Think of the way that a long flat highway seems to widen out around you from a single point on the horizon, while in the rear-view mirror everything narrows back to a single point behind you. Or think of the way that when a spaceship in a movie accelerates to its “warp” or “hyper” speed, the illusion is conveyed by the stars turning into streaks that zip radially outward off the screen. That’s how a new study in Nature says specialized cells in the retina sense their owner’s motion through the world — by sensing that same radiating flow. The finding is part of a broader discovery, made in the retinas of mice, that may help explain how mammals keep their vision stable and keep their balance as they move, said senior author David Berson, a professor of neuroscience at Brown University. The brain needs a way to sense how it is moving in space. Two key systems at the brain’s disposal are the motion-sensing vestibular system in the ears, and vision — specifically, how the image of the world is moving across the retina. The brain integrates information from these two systems, or uses one if the other isn’t available (e.g., in darkness or when motion is seen but not felt, as in an airplane at constant cruising speed). “Good cameras have gizmos that stabilize images,” Berson said. “That’s just what the retinal motion and vestibular systems do for our own eyes. So how is this done? From observations of thousands of retinal neurons led by lead author Shai Sabbah, a postdoctoral scholar at Brown, and Berson, here’s what the research team learned: Direction-selective ganglion cells (DSGCs) become activated when they sense their particular component of the radial optical flow through the mouse’s vision. Arranged in ensembles on the retina, they collectively recognize the radiating optical flow resulting from four distinct motions: the mouse advancing, retreating, rising or falling. The reports from each ensemble, as well as from those in the other eye, provide enough visual information to represent any sort of motion through space, even when they are combinations of directions like forward and up. The information from the cells is ultimately even enough to help the brain sense rotation in space, not just moving forward, backward, up or down — motion known as translation. Sensing rotation is crucial for image stabilization, Berson said, because that’s how the eyes can stay locked on something even while the head is turning. To even understand that the key organizing principle was radial flow, the researchers had to engage in the most thorough examination of DSCGs so far: They monitored 2,400 cells all over the retina via two methods. Most cells were engineered to glow whenever their level of calcium rose in response to visual input (e.g., upon “seeing” their preferred direction of optical flow). The researchers supplemented those observations by making direct electrical recordings of neural activity in places where the fluorescence didn’t take hold. The key was to cover as much retinal real estate as possible. But as the researchers moved stimuli around for the retina to behold, they saw that different types of DSGCs all over the retina worked in ensembles to preferentially detect radial optical flows consistent with moving up or down or forward or back. But if all the cells are tuned to measure the animal’s translation forward, backward, up or down, how could the system also understand rotation? 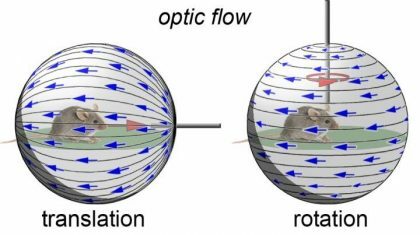 The team turned to computer modeling based on their insights in the mouse, which gave them a prediction and a hypothesis: the brain could use a simple trick to notice the specific mismatch between the optical flow during rotation and the optical flow of translation, Berson said. Think if it this way: When we swivel our head or our eyes to the right, the optical flow in the right eye appears to move forward. But the optical flow in the left eye would appear to move backward. When the brain integrates such input from the DSGCs in both eyes, it would not assume we were somehow moving simultaneously forward and backward, but instead realize the rotation to the right. Notably, mice are different than people in this context because their eyes are on the sides of their head, rather than the front. Also, Berson acknowledges, no one has yet confirmed that DSGCs are in the eyes of humans and other primates. But Berson strongly suspects they are.